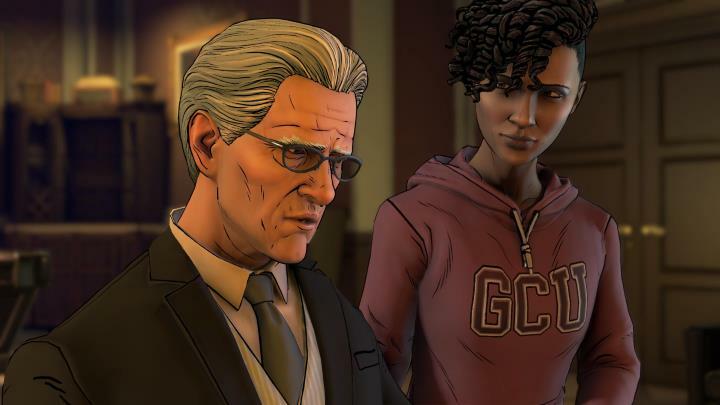 Telltale’s latest episodic Batman series is now past the midpoint, with the developer continuing the story it began in episode one last year. And although the previous episode of Batman: The Enemy Within was somewhat lacking in excitement, this latest episode (titled “What Ails You”) is more thrilling than last November’s episode three, even if there are not many exciting plot developments here either. Actually, Batman: The Enemy Within’s overarching plot involving a virus, and the efforts of a group of supervillains known as “The Pact” to get hold of it, is not so interesting. Nonetheless, it was still fun to see Bruce Wayne infiltrate the criminal underworld and cozy up to the villains in order to discover their plot in the earlier episodes, even if the events in this episode now set him up for a showdown with Harley Quinn and her gang. And like earlier episodes, this is mostly about Bruce Wayne rather than Batman. Actually, depending on a major choice involving Catwoman at the end of episode three, you might not see Batman in this episode at all, something which makes me think they could have titled this series Bruce Wayne: The Enemy Within instead, which would be truer to what’s on offer here (but not so great from a marketing viewpoint obviously). However, playing as Batman even for a short time is rewarding here due to an early sequence which takes place in a high-tech installation, where you face the supervillains in one of the best action sequences the series has offered to date. What’s interesting is that there are quite a few occasions in which you can actually lose the quick-time event fights here. In previous episodes, if you ignored the prompts to press a button or move the gamepad’s thumbstick in a specified direction, the fight would just go on most of the time, but that is less often the case here and I found myself losing the fight if I did not pay close attention and timed my button presses right. I did not feel like a passive spectator in these QTE fights so much like in the earlier episodes, which surely is a plus. It’s also great that you often have choices in combat, such as deciding whether to attack one character or another at some point in the fight, which adds variety to the proceedings. This episode features some of the best action sequences in the series to date. Of course, like in previous episodes this is mostly about choices and consequences instead of combat, and choices made in dialogue affect how things play out in the story. Or at least that’s supposed to be the case, because while the game lets you be direct, tough, polite and choose to reveal the truth or lie in conversation, this has little bearing on the outcome most of the time. A case in point is a scene involving Mr. Freeze early on. You can choose to help the arch-villain by lowering the temperature in a chamber he’s locked in, or leave him to his suffering. It’s a dramatic moment for sure, but as far this episode’s story goes I did not feel like this choice mattered much in the grand scheme of things. Regarding the other characters in the game, it’s a pity that Harley Quinn has been reduced to a secondary character here, after she was such a standout in the second episode. Actually, most of the villains are put out of commission early on, and as I mentioned earlier, it’s possible you might not even see Batman or Catwoman here depending on how you handled the big choice at the end of episode three. Actually, you might even find replaying the third episode worthwhile in order to choose a different fate for Catwoman, as you’ll get to play through a completely different sequence at the beginning of this episode. Sadly, though, not all characters shine in this episode of Batman: The Enemy Within. Such is the case with Bruce Wayne’s trusty butler Alfred, who’s involved in an incident that does nothing to further the story, and just appears to be there for shock value. Also, there’s a plot development involving Tiffany Fox which comes out of the blue, and is not entirely justified taking into account what’s come earlier in the story. I was hoping Telltale would have something more interesting in store for this character, but that has not been the case so far in the series. At least a female special agent you get to hang around with quite a bit in this episode is a superbly-realized character on a par with Bruce Wayne, Catwoman and the villains, and I am interested to see what further role she will play in this story. Like in the earlier episodes, John Doe (left) gets the best lines here. The star here, though, is John Doe, and Bruce Wayne’s relationship with the man sure is one of this episode’s highlights. What’s interesting is the fact that your dialogue choices affect how his persona develops, meaning he could end up looking up to Bruce Wayne and Batman and follow their example, or turn into the Clown Prince of Crime (aka the Joker) by the end of this episode. John Doe is brought to life thanks to some great voice acting, while Troy Baker is also great in the Bruce Wayne / Batman role as usual. Sadly, though, the music while decent is not a standout here, although the sound effects are great overall and surely added to my enjoyment of this episode. And as has been the case in earlier episodes, the artwork, animation and character design really are top-notch here too. 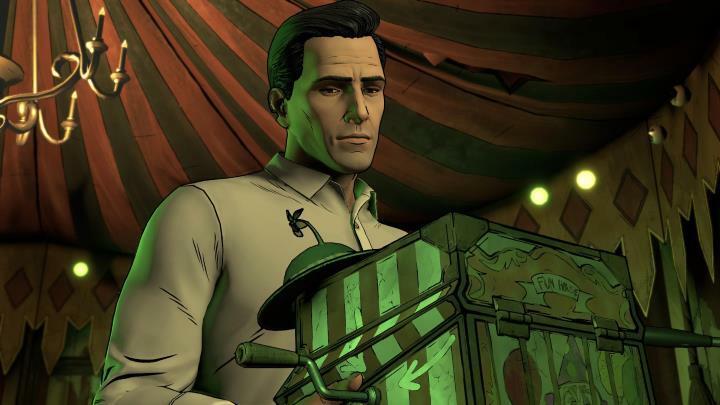 The game also sports a variety of great-looking locations, the highlight of which is a circus funhouse you visit as Bruce Wayne at some point in the episode. 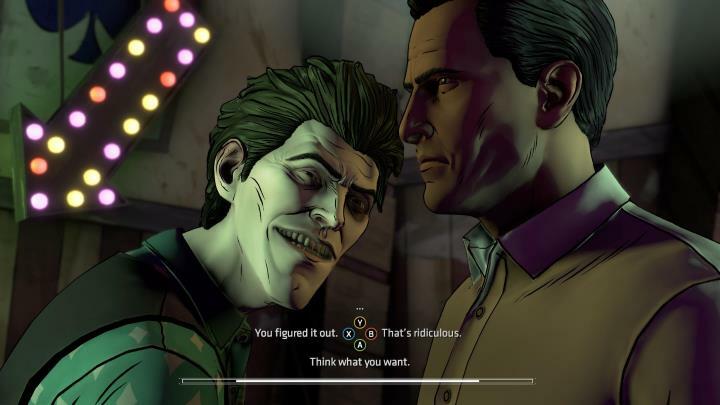 This is a mysterious and colourful setting, and also the scene of one of the game’s best sequences, which as you might imagine involves Joker-to-be guy John Doe. Other locations include a high-tech installation that, while well-designed, feels slightly out of place in a Batman game, although thankfully you also get to visit more familiar locations like the Batcave with its dark, moody interiors, and the posh Wayne Manor too. There’s also Gotham Bridge, the setting of the game’s final scene, which like most of the rest does look the part and is true to Telltale’s vision of the Batman universe. One thing I disliked about this episode, though, is that there’s less “gameplay” here than in the earlier episodes. For starters, there’s no crime scene investigation like in episode one, and even though this sequence amounted to little more than a game of connect the dots in order to figure out what happened, it is still something I missed in this fourth episode of Batman: The Enemy Within. And despite the fact that this looks and feels like the classic adventure games thanks to the usual third-person perspective and the way you control your character, there are no real puzzles to solve here except some basic shape-matching ones, which won’t tax your grey matter one bit. Not all characters get to shine in this episode of Batman: The Enemy Within. Also, there’s no big choice that leads to an alternative path in this episode like in episode one either. 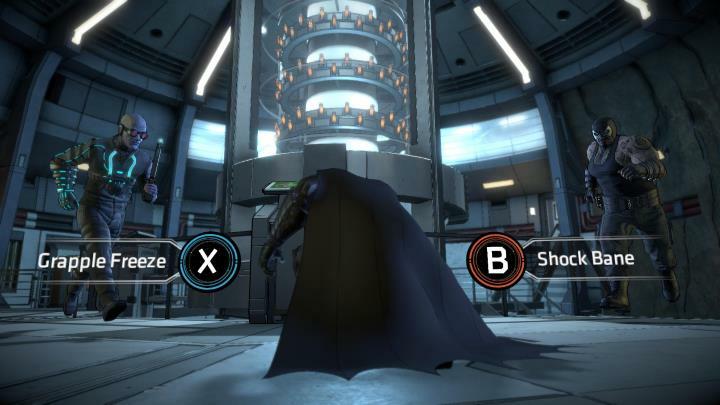 There you could choose to visit one character or another as Bruce Wayne or Batman, but not so here. Actually, at some point the game appears to be giving you the choice of accompanying one of the story’s key characters to a location, but that’s not really the case, and upon replaying the episode I was sad to discover this did not lead to an alternative path. Plus, there’s some slightly unnecessary blood and gore in this episode too, although depending on the choices you made in episode three you might not get to see this at all. Overall though, and despite the negatives, this is a pretty decent episode of Telltale’s Batman: The Enemy Within. The story is not that great, but this does deliver some exciting moments and spectacular action, and leaves me wanting to know how things will unfold in the fifth and final episode, which is slated for release later this year.